Read more about the MemoTrainer: 'What is the MemoTrainer?'. Choose the Templates tab in the main menu and click on Edit behind the template where you want to configure the MemoTrainer. Choose the Template tab and click Settings. If you use objectives in the MemoTrainer, questions with the same MemoTrainer objective are interchangeable with each other. The knowledge intake consist of objectives. For example, learners can answer one question incorrectly from a list of 10 questions with the same MemoTrainer objective. This one incorrect answer will be replaced with other questions that were answered correctly from the same objective. Only one question per learning objective will be given in a single MemoTraining. If you do not use MemoTrainer objectives, the questions are not interchangeable with each other and learners should answer all questions correctly to get a knowledge intake of 100%. 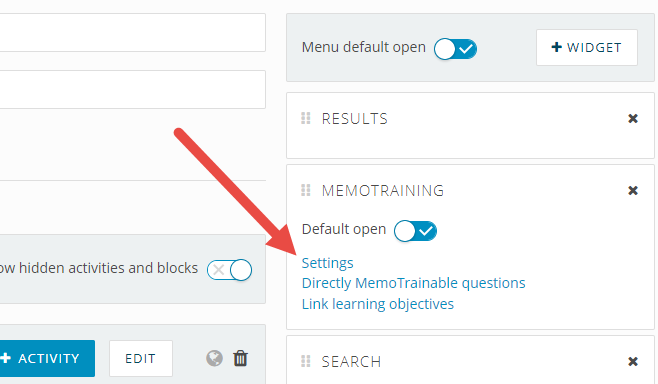 In 'Linking objectives to questions in the MemoTrainer' you can learn how to link objectives to questions in the MemoTrainer. Test preparation: The intensity of the MemoTrainings will be adjusted to the time left for the learner to prepare. Knowledge maintenance: Choose this option if there is no fixed exam date. The learner will continue to receive trainings until their course expires. The level determines how intense the MemoTraining is. The higher the level, the more often questions will be repeated in the MemoTrainer. Every time you answer a question correctly, it will be marked as such. If answers are repeatedly correct, it will no longer be asked in the MemoTrainer. This is dependent on the level you set. 'No repetition'; only answer it right once, up and until 'Excellent'; answer the question right 6 times in a row. If a student answers the question incorrect and the sequence is therefore not completed, the sequence will be reset. Back to alter answers allowed: Learners can go back to alter the answers to questions. They can do this by clicking the 'Previous' button. Or by clicking the numbers in the navigation in bottom part of the screen. If the option is unchecked, learners will only see the 'Next' button in the bottom-right part of the screen. Skip questions: Learners do not necessarily need to answer a question. Unanswered questions will be marked incorrect once the learner hands in the answers. Questions that have been skipped will be displayed in white in the bottom part of the screen. Has this option been unchecked? Then there will be a pop-up the moment the learner tries to skip a question and it will warn them that they can only continue when they answer the question first. Back to overview (continue later): Learners will see the button 'Back to overview'. The activity can be continued another time.